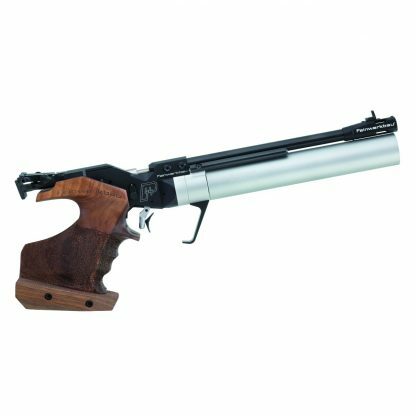 The model P44 is the quality compressed air pistol from Feinwerkbau exposed-run. Behind an elegant design to high-quality technology is concealed in best quality. 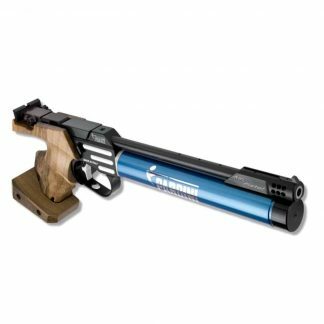 The shot pulse is almost completely eliminated by the integrated absorber in this gun. By working in the direction of the piston from a special tungsten alloy the recoil impulse is compensated when firing. In addition, relief wells provide the run and the Feinwerkbau separator for a calm shooting. The sights can be varied in this gun in length and a Verkantausgleich of up to ± 15 ° is possible. The newly designed 3-D shape handle is now better in the hand and is available in right and left version in five different sizes and can be used both horizontally and vertically pivot. The two-stage trigger can be finely adjusted and the preferred weight is 220-500 grams variable. 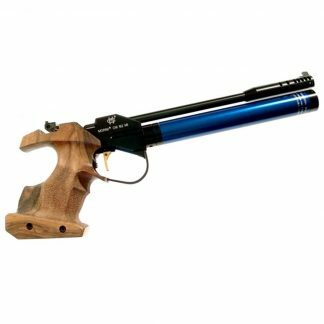 The trigger point weight can be adjusted in the range between 80 and 300 grams. Completed is the trigger by the tilt and pan the trigger blade. About a globe, it can be tilted in addition and is thus adjustable in three dimensions. The shooter has thus full control before the shot – and this with a total weight of the gun of only 950 grams. 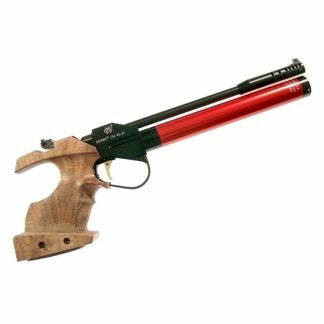 Inspire you Let this innovative interaction of the trigger components and high quality finish of the gun! The delivery takes place in a special transport case incl. Compressed air cylinder with integrated pressure gauge. New features included two weight bars of steel (approx 42g).Through its easy installation, the total weight of the weapon can be increased. Optionally available are still weight aluminum rods. In both versions, the weight rods sliding weights can be mounted – the center of gravity of the weapon can be optimally adjusted.